VANCOUVER, BC--(Marketwired - April 21, 2015) - Blackheath Resources Inc. (TSX VENTURE: BHR) (FRANKFURT: 04B) ("Blackheath" or "the Company") is pleased to report drilling results from the first ever drill programme at the Santa Helena Breccia located within the historic Borralha Tungsten Project in northern Portugal. The programme included 6 diamond drill holes in the breccia zone, which is exposed at surface, and 2 drill holes drilled outside the breccia. Blackheath also drilled two initial holes BO 3 and BO 4 which did not intersect the Santa Helena Breccia, due to the dip of the contact of the breccia body with adjacent granitic host rocks and the inclination of the drill hole. 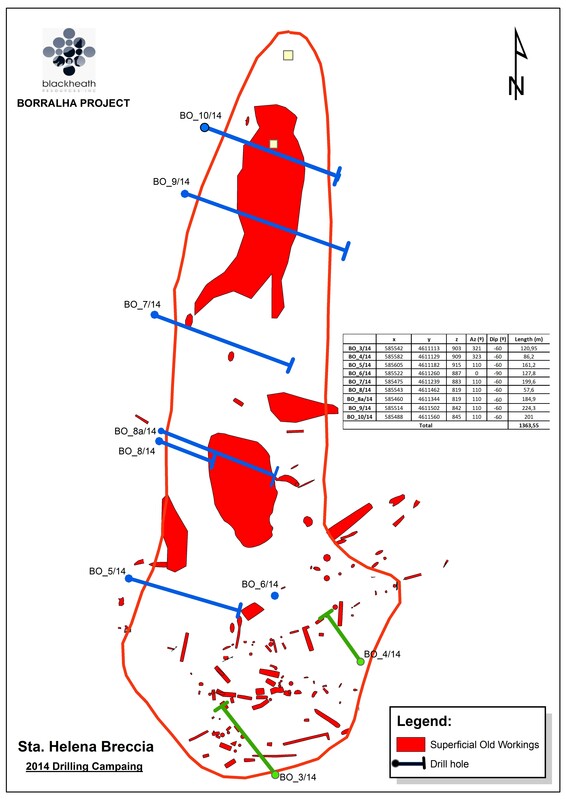 Nonetheless, these two drill holes also intersected intermittent tungsten mineralization, which further increases management's belief in the Borralha Tungsten Project and the potential for further tungsten mineralization throughout the 127 km² mining concession. Hole BO 3 had intermittent anomalous WO3 between 15 and 61 metres and Hole BO 4 intersected 19 metres of 0.06% WO3 from 3 to 22 metres. Both holes were drilled at an inclination of 60°.